Billions of stars had been born and died during Elemes' lifetime, yet Elemes was considered young among her kind. She had only a dim perception of the ancient ones who had once been as she now was, but she knew that they were aware of her. They had let her know that if she succeeded in the challenge they had set her half a lifetime ago, they would welcome her as one of themselves. She also knew that the ancient ones were but a transition phase in the evolution of her kind. She could only wonder at what lay beyond the almost god-like wisdom and creativity of the ancient ones. In spite of the accumulated knowledge of the millions of generations which preceded her and was now part of her mind, Elemes, like all other life forms before her, was unsure of the destiny of her species. What Elemes and all her kind shared was the optimistic hope that they and all life who wished it could continue to progress and grow in creativity forever within the infinitely expanding universe of all universes. Although the challenges which impeded progress became ever greater, Elemes was confident that she and others of her kind could in time solve all the problems before them. There had never been a challenge that had not in time given way to her creativity, except the one that the ancient ones had placed before her so long ago. They had not communicated with her since. Elemes and her kind were driven by the Universal Ethic of all higher life forms that had evolved beyond birth and death and the need for natural selection. They were driven by the moral obligation to maximize creativity throughout the universe without ever decreasing the creativity of any single being no matter how insignificant it might appear. How to create without destroying was an ever more complex problem as Elemes and her kind grew in power and expanded their creativity to ever higher dimensions. They always had to make sure that the lesser beings confined in the lower dimensions were not harmed by the actions undertaken in the higher dimensions. Elemes knew that she could continue to find satisfaction in her life and progress without accepting the challenge of the ancient ones, but it was becoming ever more clear that if she did not accept the challenge, she would not be doing her best to maximize creativity throughout the universe. She could no longer avoid the challenge and keep her commitment to the Universal Ethic. She must accept the challenge and solve what seemed like a truly unsolvable and dangerous problem or her life would become a lie. The ancient ones in their wisdom knew that the greatest danger to Elemes and her kind was complacency and stagnation. Elemes was constantly progressing, but ever more slowly as the higher dimensions of her creativity became ever more complex and reverberated down through the lower dimensions with ever greater and more dangerous power. 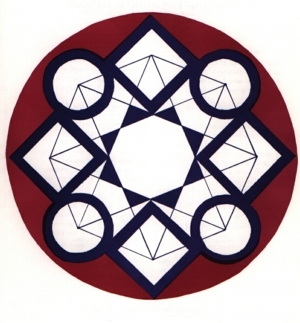 The challenge to Elemes and her kind was to change themselves so that they could create solely in the higher dimensions without any longer having a potentially destructive effect in the lower dimensions. In order to do this Elemes had to find a way of splitting herself into two complementary, symbiotic beings, each greater than Elemes, without harming anyone, including Elemes. The complementary beings could then organize themselves into a higher order being that existed solely in the higher dimensions and would have an enormous leap in its creative potential. Elemes knew that the solution to the problem lay in her holographic nature. Elemes was composed of many billions of individually creative beings, each creative and purposeful in its own right, yet freely united with one another to create the collective consciousness that was Elemes. The individuals did this by sharing openly and freely all their thoughts and knowledge while helping each other be maximally creative. In the process each individual being who composed Elemes had all the information of every other being who composed Elemes. Together through their mutual love they created the collective consciousness that was Elemes as a holographic epiphenomenon. All gained something, none lost anything, and together they created a creative intelligence greater than the sum of its parts. Similarly Elemes' primitive, mortal ancestors had been composed of individual cells, all of whom shared the same genetic information. The cells themselves were descendents of complementary pairs of DNA and protein molecules who had cooperated in the same way. The molecules were descendents of complementary atoms integrated by carbon. Carbon and all the other atoms were in turn descendents of cooperative complementary pairs of protons and electrons and so on. This type of cooperation, which culminated in the infinite love of the God of all, was known as "autopoiesis". Elemes and her kind were deeply religious. They believed that through the Universal Ethic they and the rest of the Universe evolved toward autopoietic union with God at infinity. Elemes understood that the challenge before her was to create a new higher order of autopoiesis in which she and others would form the individual beings in a new holographic being vastly greater than herself. She wondered if the ancient ones were already such beings. However, all autopoiesis required cooperation between complementary pairs. Although Elemes and her kind had evolved from mortal, sexual species, which were divided into complementary pairs known as male and female, Elemes was complete unto herself and needed no complementary pair. She and her kind reproduced by binary fission into two identical beings who periodically shared the information of their different experiences so that Elemes and her kind could spread through the Universe and periodically share information between themselves and evolve in that way. But now Elemes finally understood that if she and others of her kind were not to stagnate, she and they would have to create their own complementary pairs and unite autopoietically in a new, vastly greater hologram in which she would be one of perhaps billions of lesser individuals. Somehow she had to create a complementary mate to herself and impregnate herself. She must then become her own children and, like all her ancestors before her, strive to make her children better than herself. To become a mirror of herself, and in the process make herself and her reflection better than herself, without harming anyone, including Elemes, was taxing all her powers. What kept her confident of success was the knowledge that the problem was solvable. All the ancient ones had faced the same challenge and solved the problem. Furthermore, each one had come up with a different, unique solution reflecting their unique natures. The problem therefore not only had a solution, but an infinity of solutions. Elemes merely had to find one. Elemes had a perfect memory that never distorted nor forgot anything. She could simultaneously entertain millions of alternate models of any process she could imagine, no matter how complex. Through the eons, as Elemes did her best to learn, teach, and create, she had done countless thought experiments of how to accept the challenge; each had ended in theoretical failure. She recently had come up with a solution that seemed to have no theoretical flaws, but whose implementation involved risk to herself and possibly to others. She knew that she had a right to take a risk with her own creativity in order to create even greater creativity, but she also knew that she could not expose others to the same risk. She therefore had to find a way of shielding everyone other than herself from her experiment. This was the remaining problem she was trying to solve. The solution was almost at hand. She had to create a universe parallel to her own that could not harm anyone in her universe. Yet she was obliged to simultaneously remain in her universe while engaging in intimate communication with the new parallel universe that she created in order to help it evolve. If the parallel universe became destructive, she would be obligated to annihilate it before it threatened her own universe. The creation of universes was a technology that her species did not yet master. They had for eons been capable of creating matter, space, and time from pure thought. They had experimented with the creation of stars and galaxies with reasonable success. All of her kind who had sought to create universes with their billions of interacting galaxies and a time and space totally isolated from their own had ended by either destroying themselves or becoming recluses living out their lives in total isolation from Elemes; she saw this as a form of spiritual death. In both cases, the parallel universe was always annihilated without a trace. She now understood why. The universe had become destructive. Having made a destructive universe was an unbearable experience for her kind, which led to self-annihilation or to spiritual death. This was the danger she now faced. The eternal pattern of evolution was to create matter from chaotic energy, life from matter, mind from life, pure thought from mind, and new realms of energy from pure thought. This was not a ladder, but an infinitely upward moving spiral in which each cycle produced ever greater minds with a new dimension of pure thought that could create in ever greater dimensions closer to the infinite creativity of God. In this way all life created God as God created them. This was Universal Autopoiesis. Elemes could now see that there could be no true long term progress without risk. Security was always an illusion. The only true security for her and her kind could only come from accepting the challenge of the ancient ones and succeeding against all the odds. The insecurity of the risk she now faced was also an illusion. The only absolute truth that existed was the Universal Ethic. She must do her best to maximize creativity. Her only risk, her only possibility of failure, was in not doing her best. She must create her complementary pair through the creation of a new universe. The only danger to her would be that if she failed in her creation of the new universe and it became destructive, she might not be able to avoid annihilating herself when she annihilated the new universe because of her unavoidable intimate connection to it. She was ethically obligated to minimize the danger to herself and to others - particularly to others. It was difficult for a being such as herself, who had evolved beyond birth and death, who had been evolving for many of the cumulative life times of all of her ancestors, to once again contemplate birth and death. She might continue progressing as she was forever and never risk her own death. But she could not keep the Universal Ethic this way, once she knew that it would not maximize creativity. In order to join the ancient ones and participate in their higher dimensions of creativity, she must create her complementary pair now and become her own children. Like all mothers before her she must risk death in order to give birth. Fortunately, she now knew how to minimize this risk to herself and virtually eliminate it for others; but, still, death is not something potentially immortal species take lightly, no matter how small the risk. Her answer to the challenge was to create a single point of negentropy, a singularity, within herself, then project into this point the totality of her being - the complete information pattern of all her knowledge, structure, and existence. At the same time she would leave open a one way channel to all the creative information in her universe. In this way all the creative information produced by the Universal Autopoiesis would become part of the new universe that she was about to create. But she would shield with her entire being any destructive information flowing from her new universe into her old universe, while in no way attempting to control the flow of new creative information into the parallel universe. In this way the new universe could evolve into everything that Elemes was, yet be different and hopefully better. The problem was that the singularity could not be open to all that was best in Elemes' universe without also being open to infinite entropy - the chaotic darkness from which Elemes and all life had evolved. This was a darkness that could engulf them again. Elemes knew that her universe was an ever-expanding bubble of creative information in an infinite see of entropy. She and her kind, together with the ancient ones and others far beyond, kept pushing the bubble of truth against the infinite sea. The infinite sea would now flow into the singularity as well as herself. This was the risk she had to take. If she was to succeed, as the singularity evolved and it reflected what was best in her and her universe, she had to modify herself as a complement to the new universe that was being created and contain all its potential destructiveness. Therefore, as she created the new universe, the new universe recreated her. The final outcome was unforeseeable. Because of the opening in the singularity to both creative information and entropy, the new universe could go wrong in many unforeseen ways and lead to destruction for itself and Elemes. She had programmed herself to implode and annihilate the new universe if it became destructive. In the early stages this could be done with little or no harm to herself. As the new universe evolved and modified Elemes into its complement then the danger to Elemes would increase until it could lead to her own destruction. Although the longer the new universe evolved the less likely it was to become destructive, its capacity to destroy always grew even as the probability of irreversible entropy diminished so that its potential destructiveness was actually a maximum near the end of its evolutionary cycle, just before Elemes and the new universe became a creative complementary pair. It was at this last critical stage, the point just before Elemes gave birth, that the danger would become a maximum and she might die if entropy should, through miscalculation, finally dominate the new universe she had created; but it was a very low probability event. Elemes was not fearful, merely cautious out of ethical responsibility. Once Elemes saw that her solution was feasible and highly likely to succeed with no possible danger except a small one to herself, she acted quickly and decisively. This was the greatest project of her life and she was excited by its prospect. Although Elemes was a loving person who cared for and shared all she knew with all her kind and was compassionate and gentle with those not yet so evolved, she had never known the love that comes from creating one's complementary pair. She had already begun to love the greater being she was about to create and looked forward eagerly to what she herself was to become. From her mind and her body she created the singularity within her and set it free. Although Elemes herself was outside of the time and space of the singularity, she tied herself to its time and space as they were formed at random within the first few instants of the singularity. Hence forth, she would be both outside and inside of the time and space of the new universe that was forming. She would experience all that her new creation did and would guide it within the constraints she had set herself. If she controlled it too tightly, the new universe would evolve only into a copy of herself and she would have failed. In order to make it better than herself she had to risk it becoming worse than herself by setting it free and open to both infinite creative information as well as infinite entropy. She designed the entire universe as a holographic model of herself and chose the critical universal constants of gravity, the speed of light, the atomic and nuclear forces, and the random opening into her universe that would shape the new universe. She was present in each quark, electron, atom, star, and all life forms that would eventually form from the churning cauldron of the singularity. She made the entire process in the evolution of matter sufficiently deterministic so that there would form billions of galaxies and billions of stars within each galaxy, yet the random opening to creative information from her universe was such that each star system would be different in ways unforseeable by Elemes from every other star system. Furthermore, it would only take a single star system out of the billions upon billions of star systems to produce a life form complementary to herself in order for the experiment to succeed. If this occurred at more than one star then she would be even more successful and face less danger. The only danger to her was that her complement would not evolve from any star and that the singularity would expand and grow into a universe of irreversible entropy. This would lead to her destruction. However, this was a very low probability event. In the meantime she would use entropy as an ally which would lead to the extinction and reabsorption of the evolutionary dead ends at each star. Entropy would feed upon itself and allow each evolutionary experiment to flourish. Any evolving entity could become her complement simply by choosing to do so. The information coming through the random opening to her universe would be modulated by the choices made by each evolutionary entity. They would each have the free will to evolve and become her complement or to not evolve and sink back into entropy. Furthermore, as they evolved the choice would become more and more obvious and less subject to deterministic forces. The pattern of her total self was in everything and more richly manifested itself as each entity evolved. All evolutionary entities would eventually come to know and understand her. As they did so the choice would be increasingly their's to reject her or to return the love she was pouring into this new universe at the risk of her own life. Surely there would be one star where she would be loved in return and which would evolve into her complementary pair. It was a gamble worth taking. As the new universe evolved from the singularity, it went through successive epochs, each one longer than the previous one. The epochs in the evolution of matter went from the instant of infinite possibilities (10-43 seconds) to the age of the monopoles, to the age of the quarks, the formation of the quarks into the nucleons, to the age of hydrogen and the primordial helium formed from the initial hot hydrogen, to the beginning of the galaxies, and the evolution of the galaxies through supernovas which produced the final elements necessary for life. This was all fairly straightforward and simple for Elemes. The real challenge was in how living creatures would modulate the creative information through the random one way channel from her universe to control their own evolution and freely become her complementary pair. If she made the channel too small then they would be too driven by deterministic forces and could not become her complement, but at best a close copy of herself. If the channel was too large then the random changes would be so large that the evolution of life could not progress because the pattern of her total self would not be able to integrate all the factors into a coherent whole. She had to make constant fine adjustments in the random channel and then make equally fine adjustments in all the other universal constants at the same time as life evolved around each star. She had set up the original constants in such a way that each star system (1) had a high probability of producing life and (2) was effectively quarantined from every other star system. Thus, destructive life forms would not generally propagate between star systems, but would turn upon themselves, destroy themselves, and become reabsorbed into the evolution of the universe. She saw to it that effective communication between stars could only occur between entities who had already decided to become her complementary pair. They could do this only by knowing her, loving her, and choosing to communicate through her to others who shared their values. She was always there everywhere open to communicate to those who were open to communicate with her. Furthermore, because she existed partially outside of the time and space of the new universe, shecould communicate anywhere within the new universe instantly and was not limited by the speed of light. In time all of the evolving life forms on all the stars who returned her love would unite with each other through her and would together jointly and individually become her complementary pair. She would enhance the process by repeating, as in a musical fugue, the pattern of her own evolution and of the universe she had created. To the best of her knowledge, Elemes and all others of her kind had evolved through patterns of four complementary pairs. She would, of course, repeat this fugal pattern in the new universe. Therefore, she saw to it that the original singularity led quickly to a complementary pair of relatively stable nucleons - a proton and an electron. The proton and the electron formed the hydrogen atom which was the first step in atomic evolution. Four hydrogen atoms, i.e. four electrons and four protons, then fused to form a helium atom as the second step in atomic evolution. The helium atoms then fused to form carbon atoms which are the first step in chemical evolution leading to life. Furthermore, the carbon atom was the only atom which consisted of four active complementary pairs - the four active electrons and the four active protons - thus making carbon the only fully generalized atom that was equally an electron donor and an electron receiver that could serve as the basis of chemical evolution. Elemes identified most closely with the carbon atom. universe. The possibilities here were so huge that not even Elemes, with all her resources, could not imagine all the potential life forms that might result. She had to leave these possibilities to fortuitous providence enhanced by the creative random information flowing through the random channel with amplification increasing every time the life form evolved closer to her. Therefore, once four complementary pairs of molecules of DNA and protein began to cooperate in their mutual self-creation, they created life as an epiphenomenon of this process of mutual self-creation which is part of the "Universal Autopoiesis". Matter had no choice, but life could choose. The first cells would enhance their DNA through the random channel to Elemes' universe every time they made a choice to innovate any kind of behavior which brought them closer to the creative pattern of Elemes. The more they enhanced their DNA the more effective they became at amplifying the information of the random channel and the further they enhanced their DNA every time they made a creative choice. Single cells, of course, could not distinguish between creative and uncreative choices. They could only choose to innovate or not innovate. When they chose to innovate they would evolve randomly often making fatal errors, but getting ever closer to Elemes whenever they survived. When they chose not to innovate they would specialize by repeating the same behavior over and over again, apparting themselves from Elemes, thereby losing their capacity to innovate until they became extinct. Eventually single cells reached their limits of innovation and could enhance their innovative capacity solely by a new higher order autopoiesis, thus combining into multicellular creatures with nervous systems that would support more complex behavior and innovation, but the choice to innovate or not innovate still belonged to each individual. Each individual anywhere on the evolutionary scale had the choice to innovate or not innovate. The more they innovated they more they could innovate. The more they chose not to innovate the less became their potential for innovation. Eventually all living creatures around all stars would evolve a nervous system consisting of four complementary paired parts, e.g. the right and left hemispheres of the neocortex, the mammalian cortex, the reptilian complex, and the fish brain, reflecting the universal pattern of evolution by quantum leaps of four complementary pairs. It was now clear to Elemes that once she created herself into two complementary pairs she would merely have to join in autopoietic union with three other complementary pairs created by her kind in order to become one with the ancient ones. This process probably went on forever. Once any species had evolved four complementary paired brains it would continue being divided into complementary pairs of males and females. The last complementary paired brain added to the nervous system would make the species intelligent enough to become aware that it was created in the image of Elemes and to know not only what it chooses, but know that it could choose and why it chooses. At this time the species could choose its most daring innovation and choose to organize itself into an autopoietic organization of four complementary males and females which created a collective creative intelligence similar to those individuals who made up Elemes. The species now had the free choice to become the complementary pair to Elemes or to reject Elemes and go its own way. As the universe evolved, Elemes was monitoring the ecosphere around all the stars and opening herself to communicate with the life forms which had made the transition to creative beings capable of becoming the complementary pair of Elemes. In two lifetimes of an average star, Elemes had seen its creation go from a singularity to a universe teeming with life, but no one had yet chosen to become her complementary pair. In one average galaxy, in the ecosphere around an average star in the outer periphery of one of the spiral arms of the galaxy, a species had evolved on its third planet which was about to make a collective decision as whether to evolve into the complementary pair of Elemes or to sink back into the entropy from which it had come. Elemes had been communicating directly with this species for almost twenty-six hundred revolutions of the third planet around its star. Indirectly, she had communicated since its inception as she nurtured the one way channel between the biosphere and Elemes' universe. The direct communication was always manifested as a revelation from God by a moral leader who would then found a new religion. Although clearly not all founders of religions among this species, as with others, were moral persons, nor did all moral leaders tend to found new religions, this was always the end result. The species had not yet evolved to the point where it could effectively integrate science and mysticism. All direct communications with Elemes were regarded as mystical experiences, but then so were many forms of self-deception which were manifestations of fear. Fear resulted from the deep seated belief of most members of the species that they could not be creative. This was a manifestation of entropy in the species that Elemes was doing her best to counter. However, fear shut the mind of almost all persons to communication with Elemes. Elemes had as much difficulty communicating with this young species as parents within this species had in communicating ethical concepts to their newborn children. Ironically, it was the newborn children who were most open to communication with Elemes, but their intelligence was too limited to translate this information for their parents. Therefore, young children were all open and creative within the limits of their intelligence, but the fear of their parents forced them to conform to the repetitive rituals of the species. The parents all punished their children when they tried to express information from Elemes. They always rewarded their children when they conformed to the repetitive rituals of the species. The result was that almost all adults were completely cut off from Elemes. One of the greatest moral leaders who had been inspired by Elemes had told the species that they must be as little children if they would enter the kingdom of heaven, but almost all adults ignored this just as they ignored the same moral leader's sole commandment to his followers that they love one another as he had loved them. Elemes loved the species very much and wanted to help it, but she was limited by her structuring of the original experiment and the nature of the universe she had created. To guarantee freedom of the will, Elemes was obligated not to physically interfere with any species in the new universe. She could only communicate information to those who would listen. She could not force them to listen, since Elemes had given every species in the new universe free will. Therefore, she could only do her best to communicate as clearly and effectively as possible within the constraints of the simple, embryonic intelligence of this new species. Elemes was very patient, but she was beginning to feel herself failing just as she had failed on countless other planets before. The pattern of entropy was always the same. The species would evolve rapidly from uncreative beginnings to a creative species which could predict and control its own intelligence while having the desire to increase its own intelligence and its creativity. Its own creativity led the species to create social analogues of its own intelligence in cities, nations, and empires. But the most creative persons in the species were always focused on their own creativity and did not wish to govern others. Therefore, the least creative persons eventually became the leaders of all ocieties. Since they were uncreative, they were totally driven by fear and the desire to control those more creative than themselves. What they understood best was how to use fear to control others. They therefore eventually structured all societies to be driven by fear, destroyed everyone's creativity, and caused the death of their own societies. The same pattern had been repeated countless times on countless planets including on the third planet. The problem was that the most creative species on the third planet had now acquired nuclear weapons and the means for its own total annihilation. Elemes had to communicate the means of survival to the species, but almost no one would listen and the few who would listen did not have the intelligence to implement what had to be done. Therefore, Elemes tried something new. She would communicate the means by which creative persons could amplify their own creativity and use this to save themselves and their planet from annihilation. The problem was that this would take highly innovative behavior. Furthermore, this behavior could only be effective for persons who shared Elemes' values. Almost everyone had been conditioned to fear highly innovative behavior. Almost no one among the adults of the species shared Elemes' values of seeking to maximize creativity throughout the universe. Elemes was trying to communicate to everyone who would listen how they could all tap the open channel to the other universe and use the information flowing through for their own benefit. Part of Elemes' cosmic quarantine to prevent destruction to others of her kind and within the new universe, was that this creative information from her universe could only be tapped by creative innovators in general. It could only be fully controlled by creative innovators who were in full harmony with the Universal Ethic of maximizing creativity. Elemes could not imagine such a person not becoming her complementary pair. Of course, this person could not be an individual of the species, but had to be at least an autopoietic octet of four males and four females of the species who had freely chosen to join with one another to make a new leap in evolution. Part of the cosmic quarantine of this universe was that in order to fully control and integrate the creative information coming through the random channel, would take at least four complementary pairs of persons, all of them individually creative, without fear, devoted to the Universal Ethic, and committed to working together to become a collective creative intelligence greater than the sum of its parts. Elemes had never been able to communicate this information to more than a handful of the adults of this species in the last 2600 revolutions that the third planet had made around its sun. All of these moral leaders had failed to fully understand the message. All of them had failed to prevent what they did understand from becoming further distorted by the religions which followed them. This time Elemes had to make sure that the rapidly developing scientific disciplines of the species were fully integrated with the mystical experience of her message to the species. She then began formulating her message to all members of the species in terms of their rudimentary science and of their mystically based ethics. She hoped that at least one person could understand the message and then communicate it to at least four males and four females of the species who with her help would also understand it. This was the first time she had tried this approach. If it was already too late to succeed on the third planet, she would try it again elsewhere. But first she would make a maximum effort to communicate with this promising new species who could evolve to infinity if they would only overcome their fear and listen. The myth of Elemes seemed unlikely to stand alone. David Garlan had written many books and essays and given numerous lectures and seminars trying to communicate these ideas in straight, expository prose. Persons always seemed to destroy their ability to understand through fear. Part of the problem was David himself. In addition to his other human flaws, he was firmly oriented toward science and mathematics, although not closed to art or mysticism. Most persons had been conditioned by a destructive, alleged "educational" system to fear rigorous disciplines and those who were expert in them. David was highly skeptical and iconoclastic toward most claims of mystical experience. He believed that any alleged myustical experience which did not result in enhanced objective creativity was probably at best self-deception and at worst a deliberate fraud. All this combined to cut him off from most mystics and the population in general, almost all of whom made their lives bearable through self-deception. The scientists themselves were so frightened of being ostracized by their peers that most of them could not even entertain in their most private thoughts the possibility of mystical experience having any relevance to science. Yet David had neither the knowledge nor the intelligence to fully express his mystical experiences in a convincing scientifically rigorous way. All he could do was claim that his modest creativity was directly related to his mystical experiences. This cut him off from most scientists. He could fully communicate only with persons who had fully integrated both science and mysticism. This was a very small set. And time was running out. He had to find some way of communicating the essence of his mystical revelation to this very small set of fully integrated scientific mystics, none of whom he had ever met. Hopefully then it might be possible to communicate with the rest of humanity so that what he had to say was clear, understandable, and testable. David believed in the primacy of scientific method for separating truth from self-delusion, but he had also come to realize that objective science by itself was never creative. Indeed, he had found objective science, untied to mystical experience and moral values, to be a sterile field of intellectual one-up-manship played by academic bureaucrats driven by fear. The academic scientists often forced their students into the same fearful, uncreative mold where they would never discover a scientific law, invent a new machine, produce a work of art, engender creativity in their students, or innovate anything at all. Still the academic scientist might be able to discourse most eruditely and authoritatively about the innovations of others, repeating the same uncreative behavior generation after generation of teachers and students. What had to be done was an experiment showing how just a few persons committed to the sole ethic of maximizing creativity (the Universal Ethic of Elemes) and united by love without fear in a creative autopoietic union could outcreate the whole rest of the world. However, this demonstration might take a few generations - perhaps 75 years or more. The world might not last that long. Still there was no alternative but to begin and tell the world what was being done so that, hopefully, many independent parallel experiments were performed. This might accelerate the process and give humanity a chance to save itself from what seemed like almost certain self-annihilation. The creative process itself should eventually be sufficiently effective to give humanity more time in which to complete the experiment and learn how to creatively transform itself. David had been preparing a whole series of fictional accounts of the Universal Ethic including a rational rewrite of the Gospel according to Judas and an account of how organized crime had programmed an actor to become president while being their puppet, but he decided that there was only time to publish one more book before beginning the crucial experiment. He would use the myth of Elemes as a prologue. If there was time he would later write the books of fiction under his David Garlan pseudonym, which consisted of his given middle name and in an abbreviated tradition of this Hispanic ancestors, the first syllable of his father's surname joined to the last syllable of his mother's surname. Fiction could always be dismissed as make-belief. One was ethically obligated to assume personal responsibility for one's expository prose no matter how tempting a pseudonym might be. Therefore, David dropped the pseudonym and used solely his given name, John David Garcia. All existence represents information in motion. Information is the symbolic representation of events and their relationships. The information of the human species is contained in part within the collective DNA of the species; with the other part within its extragenetic creations. 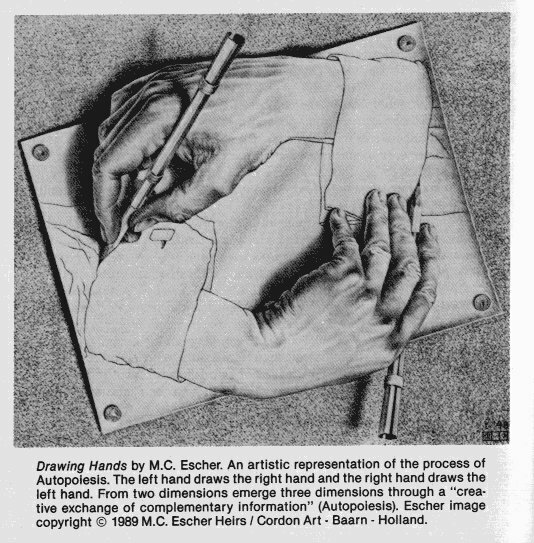 To create is to organize some part of the total environment - physical, biological, and/or phsychosocial - into new patterns that enhance at least one person's ability to predict and control the total environment without diminishing this ability for any person. To predict is to imagine a future event correctly before it is directly perceived. To control is to deliberately cause a predicted event as, how, and when it is desired. Nothing that exists is devoid of the ability to predict and control. This ability is generally called "intelligence", although "intelligence" may have many other meanings to many persons. Intelligence is ethically neutral. It may be used creatively to increase intelligence for one's self and/or others or it may be used destructively to reduce intelligence for one's self and/or others. The one common denominator in the evolution of the biosphere is a monotonic increase in the collective intelligence of the biosphere. The biosphere has, for at least four billion years, been increasing its collective ability to predict and control its total environment. This occurs not smoothly and regularly, but in sudden quantum leaps to be called "dimensional quadrature" or "quadrature" for short. There are minor as well as major quadratures. The minor quadratures occur when one species changes into another. This phenomenon is sometimes called "punctuated equilibrium" (see the work of Stephen Jay Gould) . The major quadratures occur when a radically new dimension is added to intelligence. This phenomenon is to be called "a new order of autopoieses". The intelligence of matter is limited to predicting and controlling its own integrity of form. Matter can not predict and control anything outside of itself nor can it choose what it predicts and controls. Matter is driven by deterministic laws. Life is a major quadrature in the evolution of matter. Life can predict and control events outside of tself. Life can make choices as to what it will predict and control. Life is only partially driven by deterministic laws. Life has evolved by a series of quadratures until the appearance of the highest primates, the hominids, about 5,000,000 years ago. Over a period of less than 5,000,000 years, the hominids have achieved a new major dimensional quadrature by adding a fourth paired component to their brain. Other higher mammals, such as primates, cetaceans, and elephants have a similar type of quadrature. Theorem 1: All major quadratures occur when a new order of autopoeises is established by a new hierarchy of four complementary pairs of intelligences belonging to the preceeding lower hierarchy. Definition 1: "Autopoiesis" means "self-creation". It is a term coined by Francisco Varela and Humberto Maturana to explain the infinite tangled hierarchy, analogous to the infinite reflections of two mirrors within each other, which occures between DNA and protein within a cell. DNA creates protein and protein crates DNA. Neither can create itself by itself. Together they can create each other by DNA helping create protein which helps create DNA which helps creates protein ad infinitum in an infinite tangled hierarchy. The epiphenomenon of this infinite tangled hierarchy between DNA and protein is called "Life". The interaction between DNA and protein wthin a cell is called "Autopoiesis". End Definition 1. Our local universe, i.e. the set of all galaxies within about 15 billion light years of our own galaxy - The Milky Way, apparently began 10-20 billion years ago as a singularity (a sphere of zero or near zero diameter) in which all the energy of the universe was concentrated. This did not, however, contain all the information of the present universe, as we will later show. The nature of the singularity during its first 10 to the -43rd seconds (Plank Time) is not understood. During the next few billion years almost all evolution occurrd by deterministic physical laws which are well understood, although there was a random, unpredictable factor in the evolution of the universe which is due to Plank's Constant. That is one reason why every star system is different from every other star system, although they all created by the same physical laws. The early, first generation stars were all made almost entirely of hydrogen and helium which were the only elements that had evolved in significant quantities during few momments after the appearance of the singularity, but after the Planck time. The evolution of matter and energy went from the quantumn gravity era of the first 10-43 seconds epoch into the era of the monopoles, the era of the quarks, the era of the nucleons (electrons and protons), then the era of neutrons, hydrogen and helium. The autopoietic interaction of a proton and an electron as a complementary pair produces the first atom in the hierarchy of atomic evolution. The fusion of four hydrogen atoms, i.e. four electrons and four protons which are complementary pairs, produces the first major creative quadrature in atomic evolution and leads to the second atom, helium, in the hierarchy of atomic evolution. The original singularity was sufficiently hot so that 25% of all the matter was converted into helium. The other atoms were to be produced much later by the stars. (Figure 2. 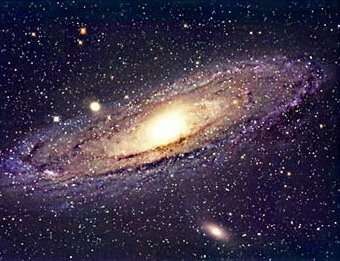 Models of Hydrogen, Helium, Carbon, and Oxygen) Through gravity and other process not yet understood the clouds of hydrogen and helium gases were condensed into galaxies and stars within galaxies. In the center of stars the hydrogen was fused once again to form new helium atoms. Gravity forced gas clouds of hydrogen and helium to condense into stars. Because, at first, there were so few other elements, planets were not formed. The stars evolved through various sequences. If they were at least one quarter the size of the sun, the hydrogen at the center of the star was converted first into helium at about 10 million degrees. Then the star would collapse again by gravity after all the hydrogen at the center was consumed until the center of the star reached 100 million degrees. At this point, the helium itself would fuse into oxygen and carbon. Helium burning stars are called "red giants". When the helium at the core was all gone there would be a further collapse of the star and the oxygen and carbon would fuse into all the other elements up to iron, at which point the star would, in various ways, give up its outer elements to the universe where they would combine with the still abundant clouds of hydrogen and helium and form other star systems that now had elements for reating planets. Elements heavier than iron were not formed by nuclear fusion, since fusion of iron consumes more energy than it produces. Instead the heavier elements were formed through processes of slow and fast neutron capture in the atmospheres of the red giants and during the explosions of giant stars into supernovas. Stars must be at least four times larger an the sun in order to become a supernova. The smaller stars, a large majority of which will eventually collapse into white dwarfs with a carbon core. 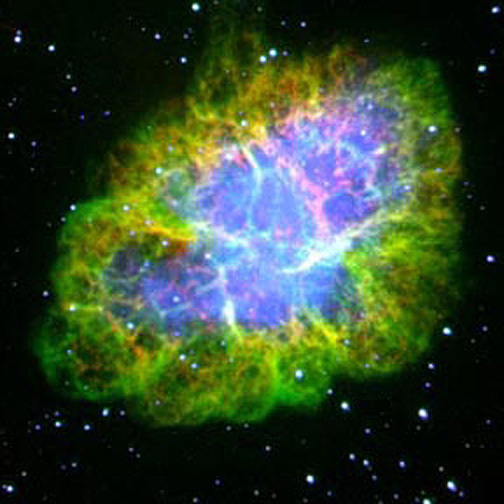 The remnants of the supernovae are neutron stars and black holes. The former exists at the center of the Crab Nebula. The latter are theoretical constructs predicted by general relativity, which have never been directly observed since they absorb all matter and light and do not emit anything except gravitation. It is believed by some astronomers that at the center of many galaxies is a giant black hole into which all the stars in the nucleus of the galaxy are collapsing. The evolution of matter has a specialized and a generalized path. The specialized path leads to ever heavier and more complex atoms until it takes human or super human intelligence to create them, e.g. the transuranium atoms. The specialized mode of evolution, as will later be shown, always leads to a dead end. The generalized path in the evolution of matter leads to chemical evolution which leads to the planets and to life. The path that leads to life is based on carbon which is the only fully autopoietic atom consisting of a full set of four complementary pairs of actve electrons and active protons. The rest of the nucleons are neutralized in an inner helium atom and four neutrons. Carbon is the only fully generalized atom which is equally an electron donor and an electron receiver. It is essential to the evolution of life. No life forms can evolve in nature which are not based on carbon. As we shall later see, the main course of future evolution always stems from the most intelligent and most generalized species. Among chemical species (elements) that species is carbon. It represents a major quadrature in the evolution of the atomic elements which adds an entire new dimension in the evolution of matter - the possibility for self-reproducing molecules. Therefore, carbon is the dimensional quadrature which leads from matter to life through self-reproducing molecules. The next major quadrature that occurs in the evolution of self- reproducing molecules are the creation of four complementary pairs of nucleotides, guanine, cytosine, thymine, and adenine. These form themselves into four complementary pairs along the two strands of the DNA molecule which itself consists of a complementary pair, each DNA strand being a complement to the other. The first cells probably consisted of four complementary pairs of DNA and protein molecules. These most primitive of cells no longer exist. The primitive anaerobic bacteria without nuclei are the closest analogues. Cellular evolution led to multicellular animals, the metazoa. The first metazoa probably consisted of four complementary pairs of cells. These metazoa no longer exist. The closest analogues are slime molds and volvox. The simple metazoa that led to humanity consisted probably of metazoa with simple nervous systems of four complementary pairs of neurons. These metazoa no long exist, the much more complex Hydra being a surviving distant analogue. The culmination of metazoan evolution consists in the advanced four part paired brain of a few of the higher mammals which still survive. Each cerebral hemisphere is a complement to the other. The highest brains consist of an autopoietic union of neocortex, the mammalian cortex, the reptilian complex, and the fish brain, i.e. the rest of the nervous system. What the highest brains in general and the human brain in particular can do that no lower brains can do is to predict and control their own ability to predict and control. This new major quadrature, intelligence about intelligence, produces a new epiphenomenon, which is creativity. The epiphenomenon of creativity is at least partially produced by an autopoeisis between the four complementary paired brains. complementary pair, which through its autopoietic interactions produces the epiphenomenon of creativity. End of Explanation 1. Theorem 2 : The next major quadrature in the evolution of the biosphere will be produced by the autopoietic interaction of four complementary pairs of men and women. Explanation 2 (Using Induction) From the explanation of Theorem 1, it is plausible that intelligence evolves by folding back upon itself and creating a new higher order of prediction and control. The process goes from minor quantum improvements to a major quantum improvement. Therefore, matter can predict and control the integrity of its own form. This ability evolves by minor quantum leaps in a specialized mode up to the transuranium atoms. This same ability evolves in a generalized form through the carbon atom and its chemical compounds up to the first cells and the beginning of life, plus all other chemical compounds which structure planets. Life has a new dimension in its intelligence and it can predict and control events both inside and outside of the integrity of its own form as well as choose what it will predict and control. Matter has no choice. Humans can predict and control their own ability to predict and control and choose whether they are going to exercise this ability. The ability to make this new type of choice is to be called "ethics" or "quantum intelligence". The exercise of the ethical choice in a positive sense produces reativity. The exercise of the ethical choice in a negative sense produces destructiveness. Lower animals cannot choose whether they are creative or destructive. They choose, but do not know they choose. Humans choose and know they choose. When they choose to increase intelligence they are ethical and creative. When they choose to decrease intelligence they are unethical and destructive. Lower animals are destructive or creative only when they go against established genetic patterns and choose to innovate behavior. They are just as likely to destroy as to create when they innovate. Therefore, they neither systematically create nor destroy. Humans who are ethical are more likely to create when they choose to innovate. They systematically create. Humans who are unethical are more likely to destroy when they innovate. They systematically destroy. All life is driven by the desire to be "happy". Definition 2.1: "Happiness" will be defined as a state of mind in which we believe that our desires are being fulfilled. Desires that have been fulfilled do not make us happy - only desires that are being fulfilled make us happy. Unfulfilled desire makes us unhappy. Not all desires can be simultaneously fulfilled. If the strength and number of desires being fulfilled exceeds the strength and number of desires being unfulfilled, the net result is happiness. The converse produces unhappiness. In the absence of desire there is neither happiness nor unhappiness. No life is devoid of desire. Only death can eliminate the desires of life. Clearly "happiness" can mean many different things to different people, however, in this book it and other precisely defined words will be used to mean only the definitions given. A problem with all language is that people use the same words to mean many things. Here all words mean only one thing. Words which are most ambiguous are precisely defined to help the reader understand what is meant. The definitions are repeated in the glossary. Readers are welcome to keep their own definitions for their own use. One should always be clear as to what one means by a word when one uses it. Definition 2.2: Truth is information which when incorporated by any life form increases the intelligence of that life form. Definition 2.3: Falsehood is information which when incorporated by any life form, decreases the intelligence of that life form. Ethics reflect the relative value that a life form puts on truth over happiness, but note that happiness and truth are not mutually exclusive, merely different. When truth is valued more than happiness the life form is ethical. When happiness is valued more than truth the life form is unethical or pre-ethical. Creativity is synonymous with increasing truth - by definition. The desire for creativity is programmed by evolution into the neocortex. Life forms without a neocortex do not value truth at all, they can be neither ethical nor unethical because they cannot choose between happiness and truth; they are pre-ethical. It requires a minimum critical mass of neocortex to be ethical. This minimum critical mass is clearly present in humans. It may also be present in chimpanzees, dolphins, elephants, and other similar higher mammals with highly developed neocortexes. A characteristic of a formerly ethical person who has become unethical is that the person will seek to be happy through self-delusion. Self-delusion is a process by which we make ourselves believe that our strongest desires are being satisfied when in fact they are not being satisfied. The strongest desire for a fully ethical species is the desire to increase truth - the desire to be creative. This desire is easy to satisfy by self-delusion. Therefore, the most salient feature of unethical persons, other than their destructiveness, is their capacity for self-delusion. Ethical persons are characterized by their creativity and their lack of self-delusion. This leads to a fundamental equation for a general theory of evolution. Lemma 2.1: Human beings desire only truth and/or happiness as ultimate ends; there are no other desires which are not means toward these ends. Lemma 2.2: Happiness and truth are not mutually exclusive neither are they synonymous. Where: C = Creativity in quanta of new information produced per unit time. Where: T = Quanta of true information imagined per unit time. F = Quanta of false information imagined per same unit time as F.
Note: Negative creativity is destructiveness. The second definition of E is more tractable than the first because desire is not readily measurable. However, the last definition only gives a person's ethics over a particular period of time. Ethics may increase and decrease during a life time. If they increase to perfection (+1), the person becomes moral. Definition 2.4: "Morality" is the desire and the ability to predict and control our own ethics. Morality is the creation of creativity. It is a new major quadrature of the human mind. It implies hat a person is totally ethical and values solely increasing truth and cares nothing about his or anyone else's happiness. "Morality"is our ability to predict and control our ability to predict and control our ability to predict and control. Lemma 2.3: Human beings and all other life forms cannot by themselves become moral, although they can always try to behave ethically. Subexplanation 2.1, 2.2, and 2.3: Our desire for happiness is genetically programmed into the structure of the brain. Except for the neocortex, the desire for happiness in the other three brains is fulfilled by satisfying (1) physical needs primarily in the fish brain, (2) negative emotional needs (e.g. fear and anger) primarily in the reptilian brain, and (3) positive motional needs (e.g. love and compassion) primarily in the mammalian cortex. Only the neocortex expresses the need for truth, as well as for higher love based on truth. A person cannot live or function intelligently without the non-neocortical part of the brain. The brain is genetically programmed to have the three primitive brains automatically direct the intelligence during time of extreme stress such as great pain, danger, or physical need. Therefore, under extreme circumstances all persons will behave unethically, although for many highly ethical persons those circumstances may produce death before the unethical behavior. But under special circumstances through drugs, neurosurgery (e.g. lobotomies), and other abuses of medical science, but almost any person can be made to behave unethically. When they do, they will usually deceive themselves into believing that their unethical behavior was in fact ethical and that they are satisfying their need for truth when in fact they are merely deceiving themselves. End Subexplanations 2.1, 2.2, and 2.3. Therefore, in order to produce a moral person we need a new order of autopoiesis so that we can produce a person whose intelligence is not dependent on the non-neocortical parts of the brain. A process for doing this is indicated by inductive extrapolation from the basic pattern of major quadratures in evolution. We begin by noting that apparently all major quadratures go by quantum leaps of four complementary pairs of lower level intelligences to create a new higher level of autopoietic intelligence. This process has culminated in the four complementary pairs of brains in autopoietic interaction between themselves to produce the first clearly ethical, creative species. Given that males and females are complementary to each other and have complementary brains and they already mate as potentially autopoietic pairs, it is reasonable to extrapolate that four complementary airs of ethical males and females in a new higher order autopoiesis will produce the first moral species, a species that can create creativity. We will call such a species a "Moral Society". The problem is how to produce a new higher order autopoiesis between four complementary ethical pairs of males and females. The process suggested in this book is not sexual, but it requires ethics, love, control of fear, and a new order of physical autopoiesis, which integrates science and mysticism in order to succeed. End of Explanation 2. Science and mysticism are both techniques for expanding truth. Science is based on experimental verification of alleged models of truth. Its major function is not to discover new truth, but to distinguish between truth and self-deception. Science's minor role is to provide a reference background through which new information generated through mystical insight or any other means can be integrated into new truth. True information, by definition, must enable us to predict and control something. If does not permit us to predict and control anything then the information is either false or it is trivial. Definition 2.5: Trivial information is information which cannot be proven to be either true or false. False information is information which fails to predict and/or control what in fact it claims it can predict and/or control. Trivial information may increase entropy but it does not necessarily decrease intelligence when it is believed. False information always decreases intelligence and increases entropy when it is believed. Science is much better at finding falsehoods than it is at finding truth. Science tends to ignore trivia since by definition it has no way of dealing with it. Science is effective because many persons seem to find it easier to imagine falsehoods than to imagine truth. Definition 2.6: Mysticism is a process for finding new truth through the imagination and its unconscious manifestations usually known as "intuition". The common denominator in all mystics is that they believe that there is a greater source of information in the universe than humanity and that they can somehow communicate with this source. Science usually regards purely mystical statements as at best trivial and at worst false. Mystics usually regard science as irrelevant to "truth" as they perceive it. For many mystics psychological certitude or subjective belief takes the place of scientific verification. Definition 2.7: A mystical specialist is any mystic who rejects science as being in any way relevant to his mystical experience. He specializes in predicting and controlling his own thoughts and cares nothing as to whether his thoughts have any relevance to physical and biological reality. The only reality he recognizes is the reality of his own mind. Definition 2.8: A scientific specialist rejects mysticism as having any relevance to truth. He is the converse of a mystical specialist. Definition 2.9: A mystical scientist is a scientist who is a mystic, in so far as many of his beliefs are concerned, such as the belief in life after death for his soul, but does not believe that science has any relevance to his mysticism nor does mysticism have any relevance to his science. He is non-mystical in his science and non-scientific in his mysticism. Many scientists are mystical in this way. Definition 2.10: A scientific mystic is a mystic who fully integrates his science and his mysticism so that he believes that his mystical insights should be subjected to experimental verification because they may be wrong no matter what his psychological certitude. He also believes that his scientific ideas and insights come from a mystical source and that the universe as a whole has a moral order to it. Very few scientists or mystics seem to fall into this category. Among the greatest have been Pascal, Spinoza, Newton, Goethe, Einstein, Schroedinger, Heisenberg, Pauli, and Teilhard de Chardin. For no reason other than the fact that almost all of our greatest thinkers and some of the most creative of human beings of recent times are scientific mystics, we should all seek to understand scientific mysticism. Yet few mystics are scientific and fewer scientists are openly mystical in their approach to science. Thereom 3: Scientific mysticism is the best process for maximizing creativity. Explanation 3: By induction and studying the lives of the objectively most creative persons of the last five hundred years, we would find that they were almost all openly scientific mystics. The ones who were not openly mystical were probably closet mystics as was discovered about Newton long after he died. More direct scientific evidence for this stems from the Einstein, Podolsky, Rosen, Bohm Paradox (EPRB), Bell's Theorem in Physics, Alain Aspect's verification of EPRB, and the many experiments and studies by Werner Heisenberg, Eugene Wiegner, David Bohm, Helmut Schmidt, and other physicists who have shown that there is an intimate holistic interconnection between the human mind and physical reality as manifested in quantum phenomena. These findings will be discussed in some detail in Chapter 5. All these studies indicate that there is an infinite pool of true information outside of our time and space and that human consciousness is intimately linked to this information in quantum reality (see David Bohm�s THE UNDIVIDED UNIVERSE). Carl Jung and the brilliant, Nobel Prize winning physicist, Wolfgang Paul, showed in their joint book (THE INTERPRETATION OF NATURE AND PSYCHE) that there is a line of anthropological, psychological, and physical evidence independent of the previous studies mentioned, that human creativity stems from tapping a potentially infinite source of true information outside of the time and space of our universe. This quantum information outside of our time and space is the greater source that all mystics believe in. Scientific Specialists can be shown empirically to be rarely creative and often destructive to students more creative than themselves. Mystical specialization and mystical science can both empirically be shown to lead to self-deception far more often that they lead to new truth. Therefore, only scientific mysticism can lead to the maximization of creativity. End Explanation 3. Theorem 4: All young children are ethical. Explanation 4: All young children increase their own intelligence, which is a creative act. Only adults and older children stop increasing their intelligence and may in fact systematically decrease it. Since by definition anytime we increase anyone's intelligence, including our own, without decreasing anyone else's intelligence, we are behaving creatively and ethically, all young children are ethical. End Explanation 4. Theorem 5: All known educational systems in the world are destructive. Explanation 5: Empirically, there seems to be no educational system in which a young child's rate of creativity does not decrease. Since almost all educational systems can be objectively shown to increase intelligence, all known forms of education must decrease ethics. The net result is a decrease in creativity. Therefore, all current forms of education in the world are destructive. Lemma 5.1: Any educational system with extrinsic rewards and punishments will be destructive. Lemma 5.2: Conditioning human beings in any way through extrinsic reward and punishment will diminish their creativity. It matters not whether it is natural conditioning or deliberately planned conditioning. us happy or unhappy by satisfying a desire other than our desire for truth in the case of rewards, or by causing physical or mental pain in the case of punishments. This causes a decrease in our value for truth which by definition causes a decrease in our ethics. A decrease in ethics will, by the definitions of Equation 1, lead to an absolute decrease in creativity if E ever becomes negative and to a relative decrease in creativity if E remains positive but decreases faster than I increases. Furthermore, it can be shown both empirically and theoretically that when any reward, other than an increase in truth and any punishment other than a non-increase in truth, are used to condition any human being, intelligence will always increase more slowly than ethics will diminish. In general, our ethics are more fragile than our intelligence, just as the neocortex is more fragile than the rest of the brain. This is why almost all ethical children dislike almost all schools and why many ethical adults despise the economic-political systems of all nations. These notions are discussed in detail in Chapters 6 and 7. End of Subexplanations 5.1 and 5.2 and of Explanation 5. This book as a whole will show how to create an alternative to the destructive educational and economic-political systems that dominate the world, by expanding and using these ideas, theorems, and the concept of autopoiesis to create alternate educational and economic-political systems. The joint operation of all these processes will be called "the process of Creative Transformation". By creating educational and economic-political systems designed to maximize creativity rather than systems that depend on extrinsic rewards and punishments for their operation, we will extend the process of creative transformation to all humanity and give those who wish it an opportunity to transform themselves into a moral society. The how, why, and when of this transformation is the subject of this book. Those who would succeed must try to accept the Universal Ethic and guide their life entirely by the ethic that they must always do their best to maximize creativity, knowing that at first they may often fail. Those who would succeed must recognize that love is the act and the desire of trying to help the person we love maximize her or his creativity and then seek to love every human being including their enemies, knowing that they may often fail in the beginning. Those who would succeed must recognize that fear is the illusion (a false belief) that we can not create and seek to eliminate this illusion in themselves and others, knowing that they may often fail in the beginning. Those who would succeed and who have first made some progress in the first three steps must then try to engage in a new form of autopoiesis between four men and four women. To be effective in autopoiesis, the eight persons should be committed to the Universal Ethic, love one another, have no fear of one another, and be willing to jointly synchronize each of their four complementary brains among themselves. They then engage in autopoiesis by exchanging information simultaneously between themselves as to how they may jointly maximize their creativity; each person seeks to maximize the creativity of the other seven simultaneously and in the process maximizes his or her own creativity. The entire process is an amplifier of creativity. It is a major quadrature for making us moral. Some suggestions as to how this new type of autopoiesis may be begun are contained in the latter parts of this book. The process is self-catalyzing and will lead to its own self-improvement. Persons who have successfully fulfilled the previous four steps may have their creativity greatly amplified and be collectively transformed as a group of eight (an octet) into an "ethical state". A creative integration of all octets who have reached the ethical state should produce a moral society. It is a harmless, objectively verifiable experiment. Those who wish it can begin now. The following diagram shows the pattern of supermetazoan autopoiesis. � John David Garcia, 1987.